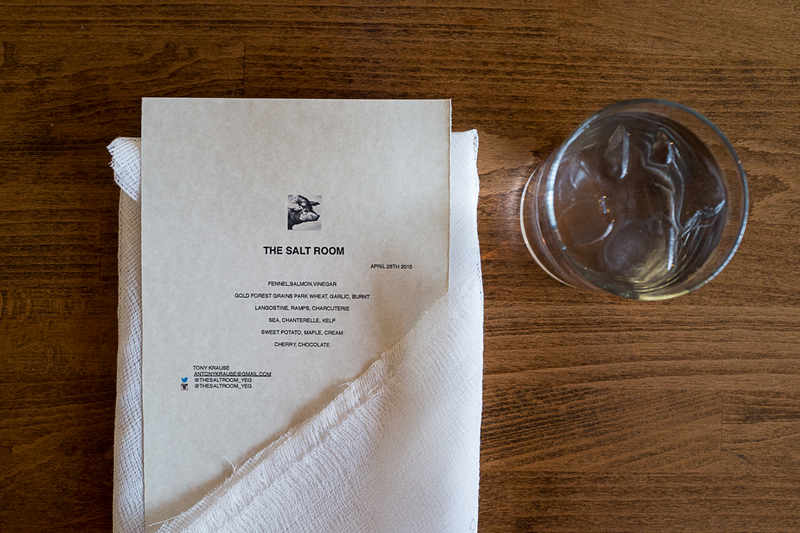 This past week I had the pleasure of taking in one of the Underground Dinners at The Salt Room. I heard some talk around town about these evenings but had no first had experience to this point. So when Sharman (Passion for Pork) said she was organizing a night, I jumped on the train. Located on the second floor of the Mother’s Market, The Salt Room normally offers a lunch Friday through Sunday. The Underground Dinners are ‘private’ meals for 10 that need to be booked and paid for in advance. What you get is a surprise dinner from the soft spoken, Chef Tony Krause. The set menu price for our visit was $70 per person with additional wine pairings at $35 per person. Sitting down, we were greeted by a menu tucked inside a cheese cloth napkin. A thoughtful food related touch if you ask me. The menu is sparse in its descriptions, but thankfully Tony will happily explain as plates are delivered. First up was an amuse-bouche of braised fennel on a salmon puree with vinegar fluid gel, fennel frond & fennel pollen. While enjoyable, I could help but wish for a set of utensils to help with the consumption. The puree did not cling to the fennel as one would hope, which had people attempting various techniques to consume the puree. Maybe everything should be a spoon next time. The bread course was next and we were served a savoury monkey bread made with park wheat flour (from Gold Forest Grains), alongside two butter options; brown butter and confit garlic butter. You know me and my bread addiction, so it almost goes without saying that these hearty buns made me a happy man. The quenelles of softened butter were a nice touch, as was the sprinkle of Maldon salt. Lovely. Tony has been working on his own charcuterie, and while I wish we were able to sample a larger section of his goods, it was nice to see a small touch on this next plate – seared Icelandic langoustine with charred ramps on a langoustine bisque w/smoked paprika, langoustine oil & charcuterie bits. A delicious, if not slightly small, offering where the charred ramps stole the show. Not showing up on our menu, the next plate was a welcome surprise. House-made moose sausage and onions (softened in whey) with nigella seeds, meat jus, sea buckthorn jus, and Mo-Na Food minor’s lettuce. The moose sausage was lean (as expected from wild game) and had an aromatic floral note from the juniper berries that were tucked inside. The onions were sweet, tender and maybe stole the show for me…softened in whey, brilliant. The pasta course arrived with the biggest explanation of the night. The ‘sea shells’ pasta (sea weed pasta, Gold Forest Frains black einkorn, seaweed from Untamed Feast) sat atop Untamed Feast smoked chanterelle puree and fumet (fish jus: fish stock reduced w butter) and came garnished with tapioca & bay leaf infusion, organic sea beans and red kelp chips. I’m a fan of extruded pasta, if for no other reason, than it’s nice to change shapes once and awhile. Tiny tubes of pasta don’t always do the best job of clinging to sauce, but the smoked chanterelle puree was so thick it had no problem. The pasta was a touch chewy for my liking, but the sauce and bitter kelp chips were standouts. The dessert course was sweet potato cooked in sugar for 24 hrs, crushed maple pavlova, oxalis leaves, a sweet potato skin crisp, and sweet cream gelato. The sweet potato was exactly as you’d expected after 24 hours in sugar, but bar none, the stand out was the sweet cream gelato. Someone please deliver a scoop of this to me every day. With the sun set on our evening, we were left to enjoy one final dish; the apres dessert snack of sour cherry gummy & frozen chocolate bourbon parfait. A poor choice of plating in my humble opinion as the chocolate bourbon parfait simply started to melt into the rocks before having a chance to eat. As we started the meal with no utensils, we finished the same and this meant picking tiny rocks off the parfait to ensure we didn’t require an apres dentist appointment. A straight forward spoon plating would have again made this dish memorable for all the right reasons.